This document is a technical summary of the Federal Highway Administration (FHWA) report, Application and Validation of RSI Framework to Pavements (FHWA-HRT-16-053). (1) The goal of this project was to demonstrate and to validate the application of the pavement remaining service interval (RSI) concept with real data. This TechBrief first describes the RSI concept and then addresses the following key questions: Does the RSI concept work? How can RSI benefit highway agencies? What do agencies need to do to implement RSI? The RSI concept does not provide an alternative to assessing the health of the network or making decisions about how to spend available funds. It simply provides clear terminology and a logical process that will create a consistent construction event-based terminology and understanding (i.e., types of construction events and the timing of those events within the concept of lifecycle cost (LCC) and/or other prioritization approaches based on streams of future construction events). An added benefit of adopting the RSI terminology is that it provides a readily available way to communicate impacts of alternate budget scenarios. The RSI concept considers the complete maintenance and rehabilitation (M&R) activity of the pavement system and does not simply consider the end of life as promulgated by the RSL philosophy. The RSI concept unifies the outcome of different approaches for determining needs by focusing on when and what treatments are needed as well as the service interruption created. The RSI uses a structured sequence of maintenance, preservation, rehabilitation, and replacement actions through LCC considerations to provide acceptable service over the lifecycle of the assets at minimum practicable cost. The RSI concept is based on the idea that pavement’s M&R requirements cannot be defined by a single value representing the end-of-life of the pavement. Instead, pavements should be described based on intervals used to communicate the amount of time before a treatment type is required to provide acceptable or above acceptable level of service (LOS) at the lowest practical LCC. Implicit in this change in terminology is the idea that describing a pavement using service intervals more closely reflects how pavements are maintained—not all pavements are allowed to reach terminal serviceability. Also implicit in this change in terminology is that a given pavement can be described using a string of numerics that represents an optimal treatment sequence and timing. Figure 1 illustrates the effect of a structured sequence of construction actions on performance and resulting pavement condition. 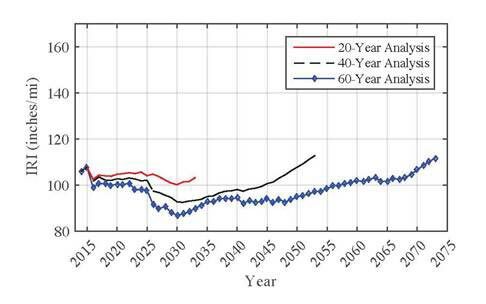 The inset table shows the RSI numerics in terms of a string of construction actions and their timing to achieve lowest lifecycle cost (LLCC) (i.e., preservation in year 3, rehabilitation in year 9, preservation in years 12 and 18, reconstruction in year 22, and preservation in year 25). The RSI concept was applied and validated at the project and network levels as part of the research effort that led to this TechBrief. The overall validation approach was to develop a general RSI algorithm and then implement the RSI using available data, models, and business rules. Within this approach, the benefits and limitations of the RSI were made clear, and the recommendations that were developed have direct implications for the current state-of-practice. The project-level validation demonstrated how inclusion of structural measurements in the selection of rehabilitation strategies is beneficial in selecting an optimal treatment sequence to yield the LLCC for a given pavement section. The approach to validating RSI at the project level consisted of developing optimal treatment strategies for a given pavement section over a defined timeframe using mechanistic-empirical models. Long-term pavement performance (LTPP) project-specific data along with various treatment scenarios were used as input for mechanistic-empirical pavement analysis software (CalME) developed by the California Department of Transportation to predict performance. If the performance prediction resulted in acceptable or above-acceptable LOS over the analysis period, the performance prediction and the structural condition were used as inputs to the LCC analyses. If the LOS needs were not met at any time during the analysis period, the treatment scenarios were revised, allowing identification of the optimum treatment sequence along with quantification of the potential monetary loss from delaying the optimum treatment, applying the treatment too early, or applying the wrong treatment. At the network level, application of the RSI concept represented the ideal management system, where decisionmaking considered the optimal treatment selection, not based on thresholds, but based on identifying the optimal treatment type and timing while maintaining an acceptable or above acceptable LOS. Validation using the Maryland State Highway Agency (MDSHA) models and data successfully demonstrated that the RSI concept can be implemented at an agency with minimal changes to the condition metrics, performance models, and other information. The RSI approach generally resulted in preservation being applied when pavements were in better condition and rehabilitation when pavements were in worse condition. The results from the validation also support the conclusion that the RSI represents a valid approach to determining and communicating future M&R needs of a pavement. How can RSI benefit agencies? With the passing of the Moving Ahead for Progress in the 21st Century Act (MAP-21) in July 2012, emphasizing total asset management and the subsequent Fixing America's Surface Transportation Act (FAST) passed in December 2015, the RSI concept is poised to help agencies use best practices with a goal of an ideal asset management and pavement management approach. The RSI concept allows agencies to optimize their investments based on the optimum timing to apply a treatment instead of being threshold driven. The RSI concept can enhance the decisionmaking process as well as improve how M&R needs for pavements are effectively communicated to stakeholders at all levels. In addition, the RSI concept is directly in line with MAP-21 and FAST and can help agencies with their implementation as they move away from a worst-first or threshold-driven approach to an LLCC approach. By implementing the RSI concept, agencies can improve decisionmaking by optimizing treatment type and timing, leading to lower yearly costs and consistent network conditions over the analysis period. Optimal pavement management decisions should not be predicated on condition-based threshold values for treatments but instead may include the application of treatments well before a threshold condition is reached to minimize LCC. Therefore, an important step toward the implementation of RSI is the development of a procedure to determine optimal strategies for pavement M&R scheduling. What Do Agencies Need to Do to Implement RSI? Acceptance and understanding of the RSI concept at all agency levels. Enabling of strategies, LCC, and optimization procedures within the agency’s existing data and pavement performance prediction models. Implementation of RSI can be completed with relatively few changes to the agency’s data and models, as demonstrated by the MDSHA validation. Changes to agency’s optimization approach, including use of longer time horizons and development of a procedure to determine optimal strategies for pavement M&R scheduling moving away from threshold driven decisionmaking. The objective function—mathematical representation of the agencies objectives—and underlying assumptions used in the RSI analyses must be geared toward agency goals (e.g., to minimize costs subject to condition constraints or to minimize costs while maintaining a specified condition. It must also communicate preferences and affect outcomes and decisions). The RSI analysis period that an agency uses to analyze LCC should be directly linked to the objective function defined by an agency. Selection of the analysis period should be based on the objective function selected (which should be based on agency business practices or goals) and the specific pavement network characteristics (e.g., deterioration rate). Alternatively, consideration may be given to applying a remaining value at end of the analysis period because this may mitigate the effect of shorter analysis period. For the MDSHA network-level validation, an analysis period was selected by comparing the results of three different analysis periods. Figure 2 shows that the first 10 years for each analysis period is similar. This is an indication that the treatments selected in this time frame are driven primarily by the initial conditions. The middle period is a demonstration that the lowest LCC option is to maintain pavements in good condition. Finally, the end trails off because there was no remaining value included in this analysis. Figure 2. Graph. Average network roughness for three analysis periods. Figure 3 compares the time until first treatment from RSI as a function of the MDSHA-determined RSL (i.e., the RSI validation results are compared to those from the current MDSHA process). It can be seen that the optimal decision results, on average, in the first treatment being placed before the remaining service life is reached. In this figure, RSL is the time until the pavement reaches a predefined terminal condition, while RSI is the time until the first treatment is applied. Figure 3. Graph. Time until first treatment from RSI as a function of RSL. 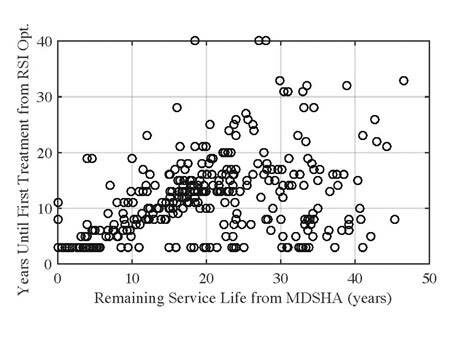 Figure 3 also demonstrates that there is practically no relationship between the time until the first pavement treatment from the RSI optimization and the remaining life information obtained from the MDSHA. The results from the validation efforts support the conclusion that the RSI represents a valid approach to determining and communicating future M&R needs of a pavement instead of defining pavement life using a single number as in RSL. Those results also show that RSL is essentially not related to the time until the next pavement treatment in an optimal strategy. Optimal pavement management decisions should not be predicated on condition-based threshold values for treatments. Rada, G.R., Visintine, B.A., Bryce, J., Thyagarajan, S., and Elkins, G.E. (2016). Application and Validation of RSI Framework to Pavements, Report No. FWHA-HRT-16-053, Washington, DC. Elkins, G.E., Thompson, T.M., Groeger, J.L., Visintine, B.A., and Rada, G.R. (2013). Reformulated Pavement Remaining Service Life Framework, Report No. FHWA-HRT-13-038, Washington, DC. Researchers—This study was performed by Amec Foster Wheeler, Environment & Infrastructure, Inc.
Distribution—This TechBrief is being distributed according to a standard distribution. Direct distribution is being made to the FHWA Divisions and Resource Center. Availability—The report may be obtained from the FHWA Product Distribution Center by e-mail to report.center@fhwa.dot.gov, by fax to 301-577-1421, or by phone to 301-577-0818. 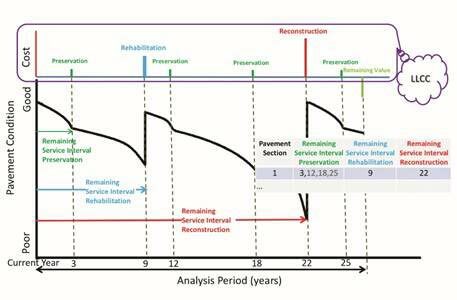 Key Words—Pavement remaining service interval, remaining service life, optimization, LLCC.